RM series inductive modules are reactive units designed to couple to WA-LCD series resistive load banks. 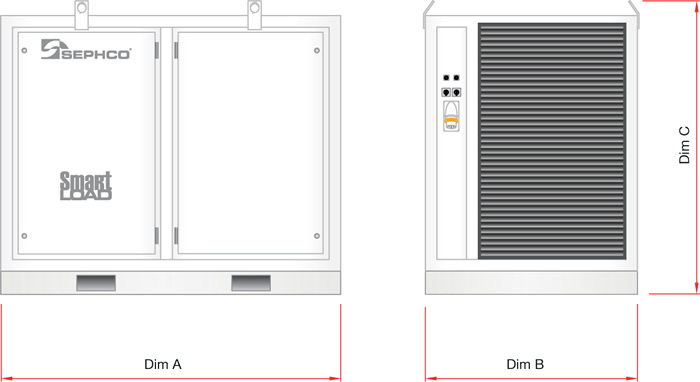 Coupling both a resistive unit with a reactive unit will provide power factor loading, adjustable from 0.3 to 1.0PF. The units are portable, fitted with input and output sockets for connection to a matching resistive load bank. RM series inductive load banks modules are ruggedly built, weatherproof construction, designed for harsh and tough environments, used for testing and commissioning of generators. RM Series inductive load banks, reactive modules are specifically designed to couple with the WA-LCD series resistive load banks for power factor loading and testing. The units incorporate iron core copper wound reactors, values matching corresponding sizes of WA type load banks. Typical applications include generator manufacturing, workshop type servicing, on-site commissioning and on-board ship generators. The units are portable, built from heavy RHS channel section and hot dipped galvanised. Fully integrated switchgear is provided with individual circuit breaker or HRC fuse protection. RM Series inductive load banks modules are fitted with MIL spec input and output connectors ready for connection to WA-LCD resistive load banks. Control is via the remote controller supplied with the WA-LCD load banks. This entry was posted in RM TYPE. Bookmark the permalink.